Place the cumin and coriander seeds in a small sauté pan and heat over medium heat. Shake pan and toast seeds until they become fragrant. About 2 minutes. Place in a spice grinder, along with the oregano. Pulse the grinder a few times to lightly chop the seeds. 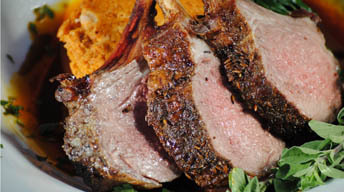 Season the lamb racks with salt and pepper. Sprinkle the cumin mixture over the racks. Allow to sit for at least 30 minutes. When ready, heat a sauté pan over medium heat, and sear the racks on both sides until nicely browned, about 2 minutes per side. Place in a preheated 350 degree over, and roast until a thermometer reads 140 degrees. Allow to sit for 10 minutes before slicing. Slice the lamb along each bone to form a chop. Place a square of the cornbread on each plate, lean 2 chops against it and sauce each plate with the mole. To make the sauce, heat a sauce pan over medium. Add the carrot and onion and cook until slightly caramelized, about 10 minutes. Add the tomato paste and merlot. Cook for 1 more minute. Add the stock and chilis and bring to a boil. Reduce heat to a low boil and add the raisins and pumpkin seeds. Cook until liquid has reduced by 1/3. About 20 minutes. Add in the chocolate and stir until melted. In a blender, puree the sauce until smooth. Adjust seasoning with salt and pepper. Keep warm until lamb is done. For the cornbread, preheat an oven to 375 degrees. In a sauté pan, cook the chorizo fully. Drain and set aside. In a bowl, combine all the dry ingredients. Mix the milk, eggs, and melted butter separately. Pour this into the dry ingredients and combine well. Fold in the cooked chorizo. Butter an 8” by 10” baking dish, and pour in the cornbread mix. Bake until a skewer comes out dry, about 15 to 18 minutes.